This Christmas, thousands of families will be celebrating in evacuation sites and temporary shelters because of recent calamities that struck the country. Amidst the busyness of the holiday season, Habitat for Humanity Philippines (Habitat) is committed to building their homes and bringing hope in disaster affected communities. Habitat’s annual Christmas program “Pamaskong Handog” (Christmas offering) inspires the public to give back to our fellow Filipinos in need during this season of giving. Companies and organizations can set aside some funds from their Christmas party budget, or gather voluntary contribution among members which will help ongoing rehabilitation efforts in various areas nationwide. In appreciation of their generosity, Habitat will match every P1000 donation with a Noche Buena pack to be shared with its assisted family under the donor’s name. “This season is the best opportunity to show that a little help goes a long way for a family who would like Christmas a bit more special.” Charlie Ayco, CEO and Managing Director of Habitat explains. 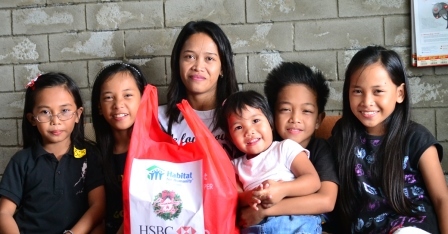 More than just giving Noche Buena packs, Pamaskong Handog is really about rekindling hope among numerous families’ who slowly rebuild and improve their lives when they move to their new home. “Like Jesus Christ who was born in a humble shelter, he was able to inspire hope to a vast majority of people. Together with our donors, would also like to lead by example and demonstrate the love of Christ through this program”, Ayco adds. Habitat for Humanity Philippines (HFHP) is a non-profit organization that serves Filipino families in need of decent homes. We bring together partners who share the same vision of transforming lives through building responsible and sustainable communities. Established in 1988, HFHP is a country affiliate of Habitat for Humanity International based in Georgia, USA. For 27 years, HFHP has served over 110,000 families throughout the country. HFHP envisions that every Filipino family has a decent place to live. Visit www.habitat.org.ph or www.facebook.com/habitatphilippines for more details.